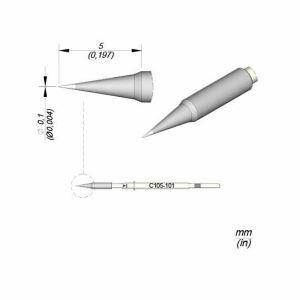 C105-101 JBC Nano Cartridges are appropriate for soldering and repairing very small-sized components at high precision, even under a microscope. C105-101 Cartridges works with NT105 Nano Soldering Iron and NP105 Nano Tweezers. JBC Tools C105-101 Cartridges will last 5 times longer than other brands thanks to the Exclusive Heating System and the Sleep & Hibernation features. JBC Long Life Tips offer instant heat up, excellent heat transfer and great durability. Order your JBC C105-101 Nano Soldering Cartridges from Howard Electronics Today.